Add £8.00 for a medium sharpening stone (Silicar) HIGHLY RECOMMENDED. This synthetic stone is not as coarse as the cheaper one that comes with the kit, but is longer lasting, and very effective. Add £9.00 for the book ‘Learn To Scythe’ by Steve Tomlin. RECOMMENDED for beginners who have not attended a course, and useful reference too for those who have. Add £35.00 for a beginners’ peening kit, consisting of peening jig and Garryflex abrasive pad. How do I learn more about peening? From time to time there are courses on peening, or scythe improvers courses which include a substantial element of peening. Particularly recommended is to attend a group activity or festival to pick up tips and share experiences. Grass, wild flowers, light weeds. Tight spaces in the garden (though shorter blades down to 40cm are available). Weeds, reeds, rushes, grass etc - a very versatile blade. Targetted attack on weeds, very tough stems, blackthorn (etc) suckers with care. 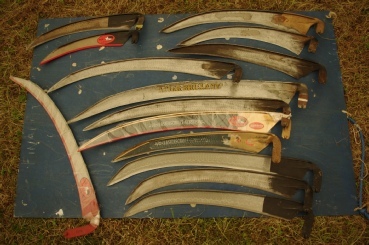 Shown above is a selection of new and used blades. Please note that new blades are varnished by the manufacturer to protect them from corrosion. The varnish should be removed from the edge, so that sharpening stones work and do not to clog up. Do I need peening equipment? Peening is the hammering of the edge of the blade. For those who are only using the scythe for rougher work, especially with a ditch blade, regular reprofiling with a file will be sufficient. Also for those who are reluctant to get involved in peening for some reason, you can ‘get by’ with just filing. However peening is recommended to get the best levels of sharpness for mowing grass and light weeds, and for promoting longevity of the blade. It is also useful for repair of damaged blades. Prices mostly follow the Scythe Shop prices. You will find cheaper scythe sets elsewhere, but they will be of inferior quality, especially with respect to ergonomic design of the snath, and the capability for being set up for individual circumstances. 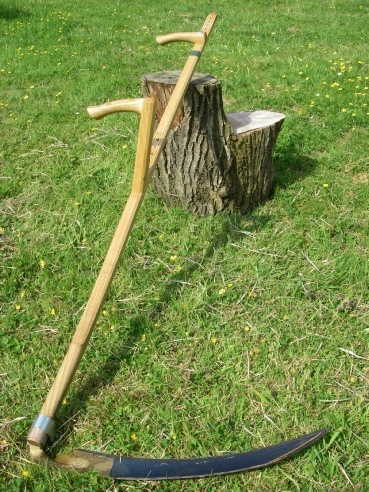 A great way to buy a scythe is on a course. You save on delivery charges and, most importantly, you get on the spot advice and get the scythe set up for you. I can sometimes deliver in the Wessex region, from a base in Gillingham, North Dorset. This costs £5-£15 depending on location and urgency. If it is not practical I will recommend mail order from the Scythe Shop. Delivery can also include a short instruction session to those new to the art. Longer coaching sessions are possible too. Please enquire for further details. I am listed on the Scythe Shop web site as a ‘Regional Distributor’. Here too are listed other distributors around the country, some of which offer a similar service. Which blade do I need? The main distinction for commonly used blades is between ‘grass’ blades and ‘ditch’ blades. The thinner grass blades can be profiled to carry a finer (and therefore ‘sharper’) cutting edge, for cutting through fine soft grasses and herbaceous plants. To use such a blade for tougher jobs, such as nettles, thistles and woody material, would risk damaging the blade. This is where the ditch blade comes in. These are heavier duty, and also have a ‘stone point’ at the tip to protect the edge from obstacles, and yet it is still possible to get these blades sharp enough for mowing grass. Sometimes it is better to have a blade of each type to cover a range of eventualities. They are after all rapidly interchangeable. There are also the very tough ‘bush’ blades which are short heavy duty blades. These are no good for grass. Which snath do I need? There are four sizes of snath, from which to select, according to the proportions of the operative. For each size of snath the grips can be moved to provide a good ergonomic fit. Most people are suited to the middle two sizes of snath. Your height is a good guide to which will fit best (though not fool-proof). If you fall into one of the overlap zones get in touch to discuss further.